The Total War series has always been about huge battles between thousands of troops. It was more about the glamour of ancient battles, the impressive nature of lines of infantry clashing against each other. The rain of arrows down on a group of soldiers or the clash of spears into a line of shielded foot soldiers. But in recent years the series has added a deeper turn based mode that sits atop the realtime engine. Last year’s Total War: Shogun 2 was what some consider the finest of the series, so how does a return to the timeline the series started on fare? Let’s find out. There are numerous ways to play Rome 2. With nine playable factions there’s a lot to explore, especially when each has their own generals, tech trees, and unique abilities. Rome, Carthage, Ptolemaic Egypt, Macedon, Pontus, Parthia, The Suebi, The Averni and The Iceni are all available in some campaign like form. 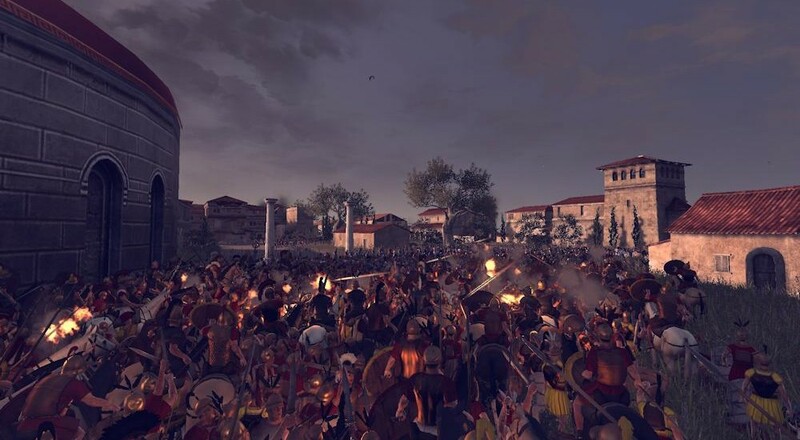 The main prologue will take you through as Rome as you learn the basics of both the turn-based and real-time game. Right from the get go I felt something was off with Rome 2. Despite a solid tutorial the interface was crowded with icons of things I had no idea what they were. Each icon hid pop-up tooltips to explain what exactly it represented, though it was still unclear on how it fit into the larger picture of the game. The turn-based sections of the game are all about growing towns, building up your armies, and researching tech all while maintaining and conducting diplomacy. The best way to describe it is a light version of Civilization where the focus is on a specific section of time. The complications of this mode come from Creative Assembly’s decision to include so many layers of the strategy onion. For example the map is broken into provinces which are broken into regions which each have a speciality perhaps a bonus to food production. Managing, remembering, and taking advantage of these stats becomes an exercise in mastering an already complicated interface. Even now after playing many hours of campaign, co-op, and skirmishes I feel like there are more things hidden behind the interface to see. The bottom line is - as strategic as the turn based mode was supposed to feel, there was very few times I felt like I was actually doing anything. It really is a shame too because there are some subtle things being done and various attentions to detail that really stand out. For instance, in a co-op campaign when attacking another army or city, the game clearly draws in reinforcement lines not only to your own supporting armies, but your co-op partner’s armies to let you know whether or not they’ll actually be able to join you in the battle. Furthermore, once the battle actually begins the map will be realistically laid out not only to the area you were attacking, but the starting position of the armies on the map. This DOES add to the strategy of the turn-based section to make sure your pieces are in the exact right place before charging into battle. The battles themselves, again, are a mixed bag. At times it seems like a solid strategy will pay its dividends. Making sure your troops have the high ground or the cover of forest often seems like a solid strategy, but during what looked to be an even battle those advantages faded. There’s other things to keep track of during a battle too - generals have abilities to turn the tide and inspire confidence in their soldiers, reinforcements and support can come from the sea, and troop fatigue should also be paid attention too.